Preserving your teeth is always the best option for your oral health, but sometimes damaged teeth are beyond repair. Dental implants are the most effective method for replacing teeth and regaining a full smile. In his High Point office, Dr. David Novak restores dental implants and offers patients the necessary resources to receive dental implant treatment in the state of North Carolina. Dental implants involve a titanium screw that is surgically placed into the jaw bone and which essentially replaces the natural tooth root. 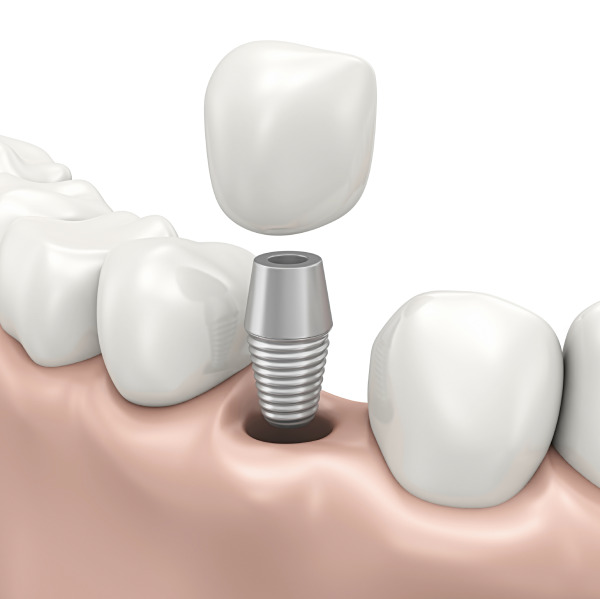 The screw is then capped with a ceramic or acrylic crown that resembles a natural tooth. Once a dental implant is placed, the natural gum tissue will begin to fuse with the titanium screw, creating optimal durability and a natural-looking smile. Since dental implants are permanently situated in the jaw bone, they are treated with the same oral hygiene as natural teeth. Brushing and flossing routines remain the same, and there are no diet restrictions associated with dental implants. Alternative teeth replacement methods can restrict everyday life, but with dental implants, patients can laugh, smile, eat, and drink without worrying about their teeth. Dental implants are the closest way to obtain natural teeth and are known to be the most effective restoration method for missing or damaged teeth. For more information about dental implants in High Point, contact Dr. David Novak today. Patients with good oral health, but who have one or more missing teeth, are good candidates for dental implants. Patients who have also experienced trauma to their mouth and, as a result, have damaged teeth, may also qualify. Dental implants are great for patients experiencing tooth loss, as well as those who can no longer stand to wear their traditional dentures. The best way to determine whether dental implants are the right option, however, is to contact Dr. Novak in High Point and schedule a consultation. If you are looking to regain your natural smile, then dental implants may be right for you. For more information about dental implants in High Point, call Dr. Novak today and schedule a consultation.